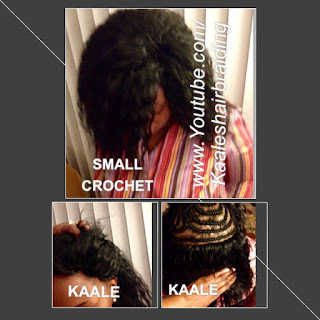 Treebraids Won Over Crochet - Clients Review Both! Isn't it wonderful to have a style that lasts as long or longer than expected? 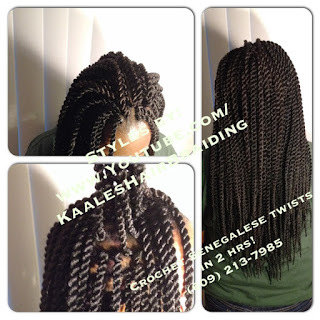 For a while now when a client has extremely short hair, instead of the required small braids to "catch" the small strands of their own hair- causing that client to sit for longer, resulting in a more expensive style, I had been recommending crochet braids. Areas of hairloss where other sections of the scalp and hair are perfectly normal were recommended a combination technique. Let's face it, severe hairloss requires a combination of different techniques to lower the cost, and time for a client. Why after decades of offering my long sought after techniques for short hair and hairloss did I start to recommend crochet braids? There was a trend for quick and cheap styles that could not be denied. However, some clients did not want the big hair that is inevitable. Not everyone is a fan of big hair. Trying to trim down the volume of big crochet hair is a time consuming losing battle. Treebraids volume can be pre-planned and controlled while installing. So now when crochet braids are offered to either existing or new clients over the phone, I hear "Oh no, I don't like crochet braids I want treebraids." Fear no more I have STOPPED suggesting it. However, there are exceptions: completely bald crown, for example. I am absolutely amazed every time, in the age of crochet, that treebraids are preferred instead. But of course, when intricate hairlines are to be 're-designed', you don't call for the butcher. You find a skilled person in that craft who knows what they are doing, loves people, and will take good care of your hair. From having strongly recommended treebraids, to recommending crochet, and now back again based on feedback. Wow, who would have thought that treebraids would win out. As you, my existing clients may already know, intricate work that looks seamless is a much slower process with treebraids, but you get what you pay for. Pre-looped, and Loose Hair, Basic, and Vixen. Non-allergic, heat friendly braiding hair! This new non-allergic synthetic hair is a game changer and its heat friendly too! Big Special starting today -I'm celebrating finally managing my sugars since last week- it's taken effect, and I am excited! This means much faster braiding time for you! I love what I do and I am glad you braid with me! Offer: Take $50 off all styles $160 or more Take $25 off all styles up to $150. Offer ends 11/29/17 unless scheduling for December. If you need hair let me know in advance if it's not 1b. I have added this amazing non-allergic 40" long deep wave hair, FREE!